This beautiful site at St. John's Point on Hornby Island was a gift to the people of British Columbia from John Helliwell. 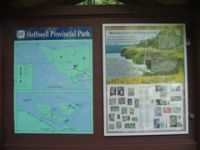 Walk through mature Douglas-fir forest to the rocky headland and the Helliwell Bluffs. From the bluffs there are spectacular views of Georgia Strait and the Coast Mountains. Along with the Douglas Fir and Garry Oak trees you will see flora and fauna that would be more at home in a desert than a Northwest rain forest. One of the best times visit is in late April and early May, when wildflowers carpet the hillside along the cliffs. Please stay on designated trails to protect these fragile areas. A recent addition to Helliwell Park is Flores Islet, which sits off the end of St. John's Point. Flores Islet was designated as part of the park through the Pacific Marine Heritage Legacy and is one of only two locations in the world where divers can see the rare Sixgill Shark. This primitive, deep-sea shark ascends from great depths to the relative shallows around Flora Islet, attracting divers and marine biologists from around the world. Located on Hornby Island. Take the Denman Island ferry from Buckley Bay, Hwy 19 on Vancouver Island; follow Denman Road to the Hornby Island Ferry terminal. Take the ferry to Hornby and follow the main road to the Hornby Island CO-OP then turn left following Central Rd to St. John's Point Rd to the park.